We are finally getting some much needed rain and while the Adirondack Park is quenching its thirst, I am spending the afternoon writing, an activity that is hard to get to when the weather is so beautiful, day after day. 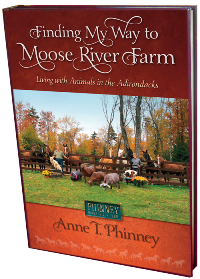 In today's excerpt from Finding My Way to Moose River Farm, Rod Phinney's amazing handiwork has not only made it possible for two more horses to spend the summer at MRF, but also reminds me of a time when I could only take care of horses in my imagination. "Anne, would it be possible for me to bring my two boys, Voltaire and Traquejo to stay at your farm this summer? I want nothing more than to trail ride with them in the Adirondacks," pleaded Carin in her beautiful Italian accent. "I'm sorry Carin, but there just isn't any room in the barn. In fact I already have one horse living in a temporary stall in the Indoor ring all by himself. Turnout is limited too," I replied apologetically. The truth is that before Rod built the barn, he wanted me to confirm the maximum number of stalls that guaranteed not having to build an addition in the years to come; an addition to house the endless number of horses who would surely find the way to Moose River Farm. Rod was only trying to prevent what he had lived through in our early days at Lakeview Farm after he had built me my two stall dream barn. Within two years, my needs changed as I began to establish myself as a riding instructor. Suddenly two horses, became three and eventually a boarder's horse moved in. Dutifully, Rod added two more stalls to accommodate the new occupants. As the horses aged and became less enthusiastic about training, I began to seek out younger prospects to fill the empty niche so that my aged animals could gracefully settle into retirement. Since my horses are with me for life, the equine population increased rather quickly. With the construction of Moose River Farm, more room could provide adequate space and resources for the blooming herd. However, even MRF has limitations in terms of manpower, not to mention funds. After careful consideration and calculation, I decided that an 11 stall barn was ample and would even provide an extra stall for the goats. With this number etched in stone, the barn was constructed accordingly. For four years during the construction phase I walked around the sight, dreaming about the day when our whole family could finally take up residence and establish a daily and yearly routine here. I must admit that at times I felt a bit overwhelmed by the enormity of the barn and its potential number of occupants. "Who is going to care for all of these horses?" I wondered. What was I thinking when I settled on eleven stalls? The first winter that we lived at MRF, I cared for five horses and felt that I had hit the absolute maximum that I could possibly care for in addition to my full time teaching job. By summer I had accepted my first boarder's horse and also decided to keep my niece Amy's horse permanently, now that she had graduated from college. By the following winter, my Friesian filly arrived. Sadly, an older horse was euthanized later that same year, but his stall was later filled by a newcomer the following spring. And then two older horses that had been borrowed for several summers became year round residents at MRF. Two years later I found a horse on the internet who I had already passed up once. I was not about to let him go the second time he came up for sale a year later. Since his arrival two other older horses, sadly, had to be euthanized which meant when a free horse was offered last fall, I had a stall for her. If you are keeping track with accurate math computation you are fully aware that the number of horses that I care for while also tending to my full time job waxes and wanes around the number 11. Carin's two horses have brought the number temporarily to 13 which in itself may only be temporary as Carin's third horse, Gladius, is hoping that he can vacation in the Adirondacks as well. Since necessity is the mother of construction, the Summer barn was erected so that two of my horses could move outdoors leaving their stalls vacant for Carin's two horses to vacation in. With little protest, Welby and Sandi moved into the Summer barn and now whinny for meals and attention within 100 ft. of the back of the main barn. Although, far from completion, the Summer barn is providing these two horses with shelter from rain and sun while allowing breezy air to keep them cool. Of course the Summer barn has also provided me with two additional stalls to keep clean. Since the Summer barn is still in its novelty state, I must admit that I love going out to tend to it. In fact the little two stall structure reminds me of the barn that my toy horses lived in when I was a child. It was nothing more than box stalls that I assembled from the cardboard that my father's shirts returned from the dry cleaner on. Under an antique breadboard table in my bedroom, the stalls were constructed to stable lots of horses. I spent hours in my room tending to the needs of my eclectic herd that included plush and plastic horses. Each horse had a stall with a water bucket and a grain bin. Since the shag carpet on my bedroom floor contained variegated green and aqua colored wool yarn, the horses spent the day out in the 'field' grazing which meant that I didn't have to clean their stalls! In my imagination I was truly caring for living horses with all the knowledge that I had gleaned from books and from the precious two hours spent in a 'real' barn after my weekly riding lesson. Many of these same strategies are applied today in the care of the 'real' eclectic herd that resides here. Tending to Welby and Sandi in the Summer barn takes me back to that time in my life when living with real horses seemed like the impossible dream. Alex, one of my riding students, frequently beats me out to the Summer barn to complete chores because she too is beguiled by its simplicity and loves maintaining it while in the presence of the two occupants who live out there. Therefore, its occupants can only take up residence temporarily during the good weather months. Summer is in full swing at Moose River Farm which means my daily routine begins early with the chirping birds and ends well after Taps plays through the trees from Adirondack Woodcraft Camp, next door. In between there is so much to do and none of it requires a trip in the car. In fact, it is not unusual for several days to pass before I leave the farm in search of groceries or to run other errands out in civilization. Instead, my days are full of nothing but animal interactions which raise my mood and keep me forever appreciative of having chosen a life at the center of all of these wonderful beings. Our four dogs are a large part of the focus. Rod and I take them, along with the goats, (Walking With The Animals), for a walk every day after lunch so that we can bask in the beauty of our woods and watch the antics of the dogs as they sniff, chase and react to signs of wildlife out there. Once they return to their fenced in backyard, they pant excessively with lolling tongues, then nap for the afternoon in the shade of our breezy maple trees. Four dogs is a bit excessive and is not necessarily the ideal number for us. However, three years ago, I began to grow concerned about the close proximity in age among our three dogs, and how, like the generation before them, (Welcome Huxley), we will suddenly be left with three dogs who age rapidly only to leave us brokenhearted yet again. Therefore, in the summer of 2009, we decided to acquire a Dachshund puppy who would still be young and able when our other three entered their golden years. In today's excerpt from Finding My Way to Moose River Farm, a shocking discovery prevents us from returning home with the wrong puppy. I located a litter of puppies who were being reared by a relative of Huxley's breeder. When the pups were two weeks old, Michele, (Friends and Blessings), and I drove out to Oswego, NY to see the precious newborns. The puppies were so helpless and tiny! With her nose poking through the wire mesh of the kennel, their mother remained focused on every whimper emitted from the plastic dishpan that the pups were presented to us in. Although the puppies' sealed eyes and plugged ears had yet to reveal their individual personalities, I gravitated toward the only liver colored male with little white toes on his back feet. For the next four weeks I dreamed about my little male puppy with his white digits while counting the days until he became ours. Six weeks after Memorial Day weekend when the puppies were born, the breeder declared them weaned and ready to go to their new homes. With great anticipation Rod and I drove out to Oswego arriving by late morning. Having expressed interest in only a male puppy, the breeder had accumulated the males in her kitchen in preparation for our visit. Seeing them again, now four weeks older with eyes wide open and clowning about on sturdy legs and paws, Rod and I became enchanted. We began picking the puppies up to inspect them. Of course I was looking for the special little male with white toes. As we began to make our final decision, Rod had fallen in love with the first one that he picked up. The pup sat in his arms against his chest without resistance and seemed to have claimed Rod as his very own. I, on the other hand, had finally located the white toed puppy and was determined to make him our final decision. But Rod had made the choice already and reluctantly, I put my puppy back in the dishpan with the squirmy mound of remaining pups. Next, I signed the check that declared us the owners of the little puppy in Rod's arms. I must admit that I felt a bit sad at that moment. The puppy I had chosen was now up for grabs and I was walking out the door with a puppy whom I hadn't dreamed about. Further confusion veiled my thoughts when Rod showed me that his puppy had white hind toes too. I was certain that only one of the little males possessed them making him an individual among the mass of 4 or 5 in the dishpan. Off we went with our precious cargo. Once in the car, Rod handed me the little angel who I held while he drove. The puppy was frightened but snuggled in my lap as I caressed him with my hands. Eventually, the little baby fell asleep and my emotions began to let go of the puppy left behind in order to embrace this tiny one about to join our family. Twenty minutes later we pulled into the parking lot of Walmart so that Rod could run in and buy a few necessities for our puppy, including puppy food and a toy or two to comfort him. While Rod shopped, I began to study our puppy from head to toe and was particularly interested in the little white toes that were nagging at the back of my mind. As I turned the puppy over I made a startling discovery. He was a female! Suddenly, my mind began to race as it occurred to me that we were going to have to return this little puppy to the breeder and retrieve the little male with the white toes. For one thing, the females cost quite a bit more money than the males. But the most important reason was because we already had an alpha female dog at home. Our West Highland Terrier, Nina, may have made life very difficult for another female dog and we weren't willing to take the chance and find out. By the time Rod returned to the car, I had already made the phone call to the breeder who was now expecting us to return the little female at once. In fact when we arrived at the house, she met us at the door and grabbed the little female quickly while shoving the only male puppy with white toes back at us. It was an uncomfortable situation, but given that she had assembled all the males for us to pick from, it didn't occur to either Rod or me to actually confirm gender with our own eyes. Of course in hind sight we should have and certainly will in the future. Back in the car I began to study the little creature who had captivated me four weeks earlier and who had entertained my thoughts ever since. He looked up at me with his almond shaped eyes and began to 'speak' in a language of words spelled with consonants only. "r vr m, rd vr," he sighed as I held him up in front of my face for a full frontal view of his tiny body. "rd hrp vrd dr."
And so life with our white toed puppy and his extraordinary vocabulary began that day. Although we still wonder from time to time, what happened to the little female with the mistaken gender identity, there is no doubt that we have the special dog who was meant to be ours. When I visited the puppies for the first time at 2 weeks old, I selected the only male who had little white hind toes. After a gender identification glitch, we arrived home with our six week old baby and named him Hayden. Hayden has grown up into a wonderful little dog who is full of fun and loves to play with our West Highland Terriers, Nina and Niles. When the 'Westie' family reunites several times a year, a group photo is always taken. From left to right; Huxley, Niles, Nina, Lynnie, Xena, and Hayden. It is hard to believe that a whole year has passed since the first presentation of Hoofbeats in the Adirondacks took place at Moose River Farm. A whole year! Next Thursday, July 12th, Hoofbeats returns with a brand new slate of performances that includes vaulting, high level Dressage and an all new Quadrille. 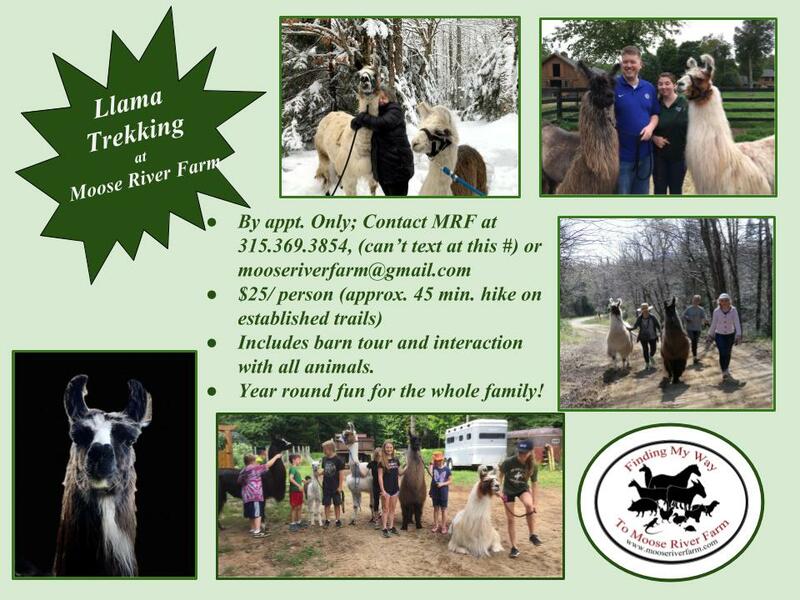 After last year's Hoofbeats, I sat down to reflect on the experience for the last chapter of Finding My Way to Moose River Farm. It seemed fitting to end my first autobiographical volume where my love of horses and my love of music united in such a grand display of artistry. As finishing touches fall into place for the 2012 performance, memories from the first one motivate my team and me to pull it all together for a second time. Horses are such noble beings, full of the same grace and natural beauty that abound in the mountains, lakes and other landscapes of the Adirondacks. Each year thousands of people visit our region seeking out riding stables that will enable them to explore the woods on horseback. Horses and the Adirondacks are a natural association. In July of 2011 the concept of horses in the Adirondacks was taken to a whole new level when horseback riding was displayed as an art form outside of Old Forge, NY. 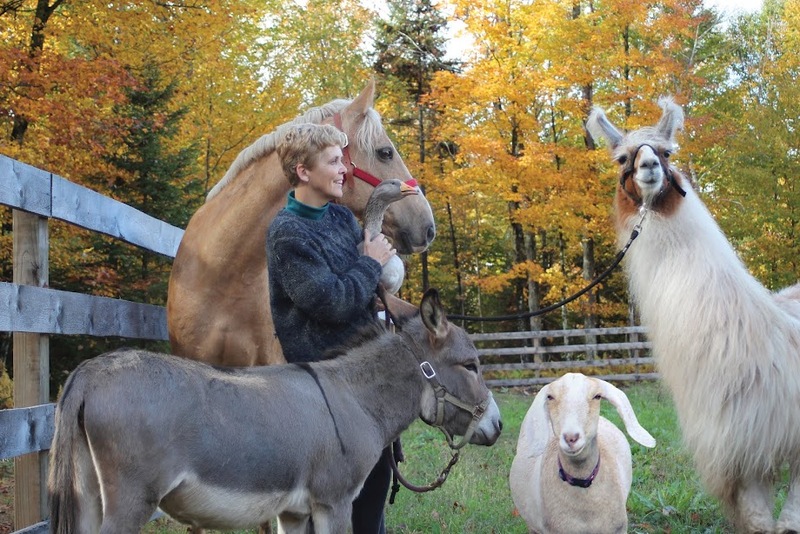 Moose River Farm set the stage for the first production of ‘Hoofbeats in the Adirondacks’. The show combined a variety of equestrian performances with moving music that transformed the training facility into a sunlit theater. All proceeds from ‘Hoofbeats’ went to View, the new home of the Old Forge Arts Center. For many years I have tried to come up with incentives to keep my more advanced riding students motivated in their training. Due to the distance that we live from any sort of horse show circuit, there is little opportunity for the students to compete. The advanced age of my equine charges also prevents campaigning horses on the competitive level. I needed to come up with something to give my students a goal to train towards, thus encouraging them to ride with purpose. 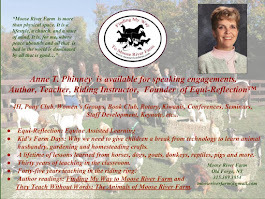 In July of 2009 ‘An Evening at Moose River Farm’ displayed the various levels of rider’s skills in a riding ‘recital’ format. Set to ethereal and up-tempo background music, each student ‘performed’ for an audience of about sixty parents and family members. The combination of music and horses was magical, and I couldn’t help feeling that there was something within this genre that could be developed into an art form. By the winter of 2011 the concept of ‘Hoofbeats in the Adirondacks’ was beginning to appear with great clarity. On the home front Moose River Farm established a mounted Quadrille composed of four young ladies on horseback who performed with cavalry style precision to the theme from The Magnificent Seven. By late May the Quadrille was ready to fine tune the choreography that my good friend and musical expert, Jean Risley, (Friends and Blessings), and I had put together. While the Quadrille’s routine improved with every practice, my mind began to develop a performance in which a bipedal human dancer and a four footed equine athlete could perform together. The ‘duet’ demonstrated the unique similarities between two entities encouraging spectators to consider the bond between them. As ‘Hoofbeats’ loomed into view with only three weeks to go, a simple routine was assembled with a lovely show style rider from Texas, named Chloe Pedersen and a local dancer named Roy Tracy. A handsome Paint gelding named Partly Cloudy, (Joshua), provided the perfect compliment to Roy’s limber dance abilities. The performance began with a brief display of vaulting movements that flowed over the Paint’s back, while Pink filled the atmosphere with Glitter in the Air. When Roy dismounted the horse in a front flip it was Chloe's turn to sit in the saddle and pick up the reins. From that point Chloe rode a simple Dressage test that displayed the horse’s natural rhythm at the walk, trot and canter, while Roy leaped, and glided close by. The third act of ‘Hoofbeats’ combined a haunting melody, Conquest of Paradise by Vangelis, with the Baroque beauty of two Dutch Friesians inclulding my own six year old mare Piepelotje. To accompany us in this performance, I enlisted the help of trainer Julie Fisher who owns Havenhurst Farm in Barneveld, NY. She brought her Crown mare, Herlijk to ride the duet with me which displayed the sheer vibrance and raw power of our gorgeous black horses with their flowing manes and ‘feathered’ ankles. As poised and practiced as these three performances were, ‘Hoofbeats in the Adirondacks’ still needed to showcase horseback riding at an even higher level. To complete the program two FEI, (world class) riders agreed to bring their own horses and perform for the crowd. Catherine Howard, a USDF Bronze and Silver medal certified Dressage rider and trainer performed a Kur on her Lusitano gelding, Xerife. She and her horse performed as a pair of pirates to the theme from Pirates of the Caribbean by Hans Zimmer. Darleen Callahan owner of Ollyoop Farm in Mt. Vision, NY also signed on to bring her Grand Prix Oldenberg mare, Adel Adrianne and perform a Kur with a Circus theme. With acts in place and practicing regularly, there was only one thing left to do; pray for glorious weather and no flies, the latter which could ruin any degree of comfort for horses, riders and spectators. When July 7th dawned, my prayers had all been answered. The day was bright and sunny with a high in the mid 70’s. The bugs remained at bay as well. Finally, the 2:00 hour ticked into sight. All of us involved in the organization could begin to sigh in relief as our efforts were about to pay off. Shortly after 1:00 pm the initial spectators began to make their way through the woods between the designated parking area and the barn. They followed a trail of golden horse shoes which inevitably led them to the seating area at the front of the arena where the horses and riders were about to perform. By 2:00 pm over 200 people had assembled in anticipation of the spectacle about to emerge from months of preparation and weeks of practice. It was show time! After a brief introduction from the President of the Old Forge Chamber of Commerce, Mike Farmer, Miriam Kashiwa the founder of the Old Forge Arts Center spoke about the connection between horseback riding and performing arts. Her calm inflections and articulate manner welcomed all who had come to watch various levels of Dressage set to music. I couldn’t think of a better way to set the audience up for the spectacle they were about to witness. CNY news anchor woman, Laura Hand took the microphone from Mike Farmer and proceeded to announce each of the performances. Her immense knowledge of sport horses educated the crowd between acts filling in any stagnant lapses of time. The intense time and training that went into each of the three Moose River Farm performances for “Hoofbeats” paid off as the show opened with a tribute to the horse-human bond in A Dance Between Species. Next, MRF rider Courtney Holt demonstrated the unique trust that connects horse and human when training begins with silent communication between them in Join-up. She and a bay gelding named Sandi began with a brief playful chase that sent him galloping with exuberance around the ring. After a few minutes he was allowed to stop, approach, and follow at her shoulder as she walked about the ring. Then she climbed up on his back and proceeded to ride him sans saddle for a brief demonstration of their mutual trust in each other. At intermission, New York Times bestselling author, Susan Richards, (Chosen by a Horse), read an excerpt from one of her books. This allowed time for the FEI riders to prepare for their long awaited performances. As the crowd took their seats for the second half of the show, Cowboy Will Hollister demonstrated for the audience what they were about to see using laymen terms as Laura Hand requested the formal term for each movement. “Can you show us some tempi changes, perhaps every stride? Laura suggested. After a brief scan of his notes that Cowboy Will had jotted down for reference, he addressed the audience in words easily understood by those not familiar with technical Dressage jargon. “Oh that’s just when the horse goes off skipping,” he affirmed. “Come on Moose, let’s show them how we skip. Cowboy Will then took off at the ‘skip’, changing his lead every stride with a swish and a flare! When the FEI riders took over the ring they brought a whole new level of the horse’s capabilities to the stage by performing piaffe, passage and tempi changes to moving music. Their costumes blended into the theme of their music which resulted in a playful and relaxed exhibition of the sport they had trained so thoroughly with. Darleen Callahan demonstrated the various movements that she and Adrianne had perfected in the years that they showed at the Grand Prix level. As the spectators headed back through the woods to their cars at the end of Hoofbeats in the Adirondacks, the organizers and I took a quick glimpse into the future at July, 2012. What we saw excited us enough to begin planning for next year! Photos by Michele deCamp and Don Allen. Over 200 spectators enjoyed Hoofbeats in the Adirondacks. CNY news anchor Laura Hand was the emcee. ...before Chloe took over the reins so that Roy could dance with Joshua. The Friesian Duet with trainer Julie Fisher from Barneveld, NY. NY Times bestselling author, Susan Richards, (Chosen By A Horse), signed copies of her books. At intermission, Cowboy Will entertained and educated the crowd about Dressage. FEI rider Catherine Howard performed on her Andalusian gelding, Xerife. FEI rider Darleen Calahan rode her Grand Prix mare, Adel Adrianne.